Sometimes it's fun to get away from the tradition cards and game boards when it's game night. 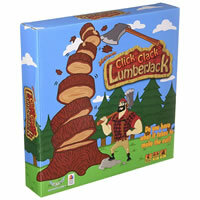 Click Clack Lumberjack is a fun hands on chopping game where you'll attempt to knock off bark from a tree. The game pieces are nicely made and unique. You've never seen a game like this before (except for similar game concepts as jenga...). Click Clack Lumberjack can accommodate up to seven people which is impressive for a game this small. Games don't take long at all to play which means revenge matches are in your future. Join in the fun of play this game and buy your copy of Click Clack Lumberjack today. Gain points by knocking off Bark with the Axe. Lose points by knocking off Core pieces. Player with the most points wins! Inside the box are 9 cores, 36 bark pieces, 1 trunk, 1 axe, 1 sticker sheet with 4 grub stickers and the official Click Clack Lumberjack game rules and instructions. Please keep in mind that the official Click Clack Lumberjack party rules and instructions could be different depending on the game version you have. The rules below are some of the exact directions on how to play Click Clack Lumberjack. Share with us your comments, funny stories, tips, advice, strategies, creative ways to play, questions about how to play, problems with the rules or anything you want about Click Clack Lumberjack. All submissions will be reviewed within 24 hours. Click here to add your Click Clack Lumberjack comments.